This cake is for grown ups. It is rich, decadent and alcohol infused. There is something about soaking dry fruit in liquor, and then having to wait until it becomes plump and moist, that excites me! I’m not a big drinker, however my husband has an every growing scotch and whiskey collection that I’ve grown to enjoy the smell of. The Macallan Edition No.2 Single Malt Scotch Whiskey caught my eye for this recipe as it was a limited edition release by Macallan Master Whiskey Blender Bob Dalgarno and the chefs behind El Celler de Can Roca, the 3 Michelin starred restaurant in Spain. I can smell the fruity and even chocolatey notes in the alcohol and thought they would be wonderful paired with prunes in this cake. The cake has almond flour so I decided to experiment (which I enjoy) and make a nut free version using plain flour, however I added my favourite bourbon for cooking, Maker’s Mark in this second version making it a Chocolate, Prune and Bourbon Cake. I think the psychologist in me revels when there’s any form of experimentation happening. I found it interesting that with time, the Macallan seemed to absorb the flavours of the prunes and they melded together to make me think of a Christmas Pudding. However the prunes with the Maker’s Mark smelled consistently of just the bourbon. Both cakes came out of the oven at the 35 minute mark (which was the high end of the recommended cooking time) and in hindsight I think it would have been perfect to remove them 5 minutes earlier to get an even more gooey centre. The result was a beautiful cake. Rich, dense, moist, decadent yet not overly sweet, in fact, most of the sweetness came from the alcohol infused prunes. Surprisingly, while the cake was definitely luscious and satisfying, it still left you wanting more, looking for another hit of sweetness and whiskey from the succulent prunes. *I used Macallan Edition No.2 Single Malt Scotch Whiskey instead of the Irish Whiskey called for in the recipe. *I made a second nut free version substituting plain flour for the almond flour, using the same amount of plain flour as almond flour. *I’m including the recipe with my findings and my thoughts on the nut free version. 1. Soak the prunes in whiskey, if you can do this the night before, all the better. 2. Peheat the oven to 180C/160C(fan). 3. Butter a 20-23cm cake tin and line with baking paper (I used a 21cm tin). 4. Put the dark chocolate and butter in a heatproof bowl and place over a pan of barely simmering water. Make sure the water does not touch the bottom of the bowl or it may spoil the chocolate. Once the chocolate has melted, take the pan off the heat to cool slightly but keep away from any draughts. 5. Put the whites and yolks into two separate bowls and, starting with the yolk, add half of the caster sugar and whisk to thicken. 6. Fold the thickened yolk into the melted chocolate and set aside. 7. Chope the prunes into eighths and add to the chocolate mixture along with the ground almonds (or plain flour if making a nut free version). 8. Beat the egg whites with the remaining caster sugar and the sea salt until soft peaks form. 9. Fold into the chocolate mixture until just incorporated. 10. Pour into the prepared cake tin and bake for 30-35 minutes. The cake will be slightly soft in the middle but do not overtake it or the gooeyness will be lost. (I cooked my 21cm pans for 35 minutes and the gooeyness was barely there so I recommend 30 minutes). Straight from the oven, I was drawn to the nut free version as it seemed to be slightly sweeter. Both cakes are very rich and you are a left looking for some sweetness from the prunes to give you a break from the almost bitter richness of the chocolate. The original almond version has more moisture and lushness on the tongue, and you can taste the ingredients individually. The almonds, the prunes and the alcohol hold their own integrity and can be tasted in each mouthful. The nut free version has a more muddled taste. The texture is more dense and as it hits the mouth, it feels almost sticky. The flavours of the cake come next and they are more mild than the almond version and I think more child friendly. There is more sweetness and less of a hit from the alcohol. It’s as if the strong flavours in the cake have fused together and have taken the edge of each individual ingredient and melded into a very pleasant mouthful that is easier to eat than the almond cake that is more intense and has more of a slap to your face intensity! Tags: alcohol, baking, cake, cakes, chocolate, cook the book, cooking, cooking with alcohol, delicious, food, macallan, prunes, the violet bakery cookbook, whiskey | Permalink. I was very excited when my Baking with Julia book arrived! And in plenty of time to join in on this week’s recipe scheduled for Tuesdays with Dorie! I planned to enjoy making this recipe. I set aside the last weekend of summer to take my time and play in the kitchen. And this recipe fit the bill perfectly as it could be stretched over a couple of days. I made the dough and placed it into the fridge. I had a two days up my sleeve until I had to cook it, so how easy was step 1! In fact, it was so easy and stress free I decided to start on the prune lekvar. 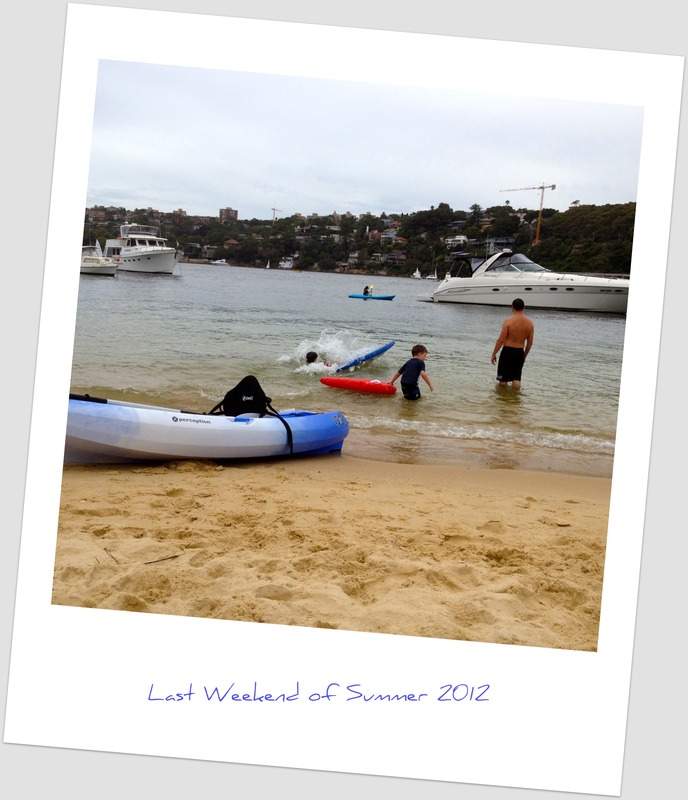 We went on to have a great weekend at the beach with the kayak and the kid’s various boards. It’s amazing what kids can do with boards when there are absolutely no waves around! Creativity can be expressed in so many ways! It was great knowing that whenever I was ready, my dough and lekvar were there, waiting for me. And breaking the steps up like this, made what initially looked like a daunting recipe, into something manageable. My food processor was sealed but somehow I ended up with a fair amount of this nut dust all over the kitchen. 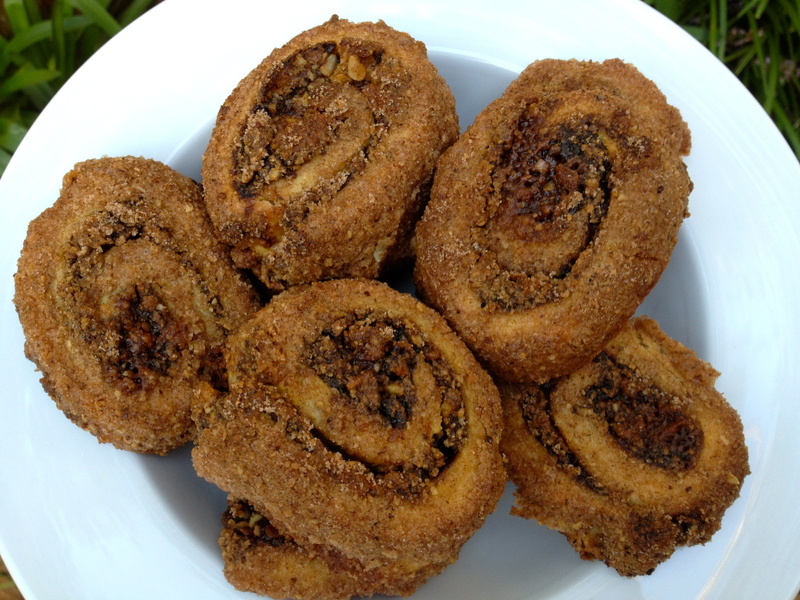 It was a deliciously nutty, sugary, cinnamon-y mixture. Unless you’re somewhat allergic to nuts! Then it’s just a nerve wracking experience with kids coughing and complaining of heavy chests. I used a mixture of hazelnuts, walnuts and pecan (the least allergic of all the nuts to our family). But I guess with 3 kids, all allergic to various degrees to different combinations of nuts, it was going to be disastrous to some degree! So after dosing kids up on antihistamines, I decided to skip the dried fruit and finish as quickly as possible! I’m kind of glad I skipped the dried fruit. I could really taste the prune butter and it was balanced beautifully with the nuts. Any more dried fruit and I think it would have been too sweet for my taste. Granted, they’re not the prettiest looking things, but I loved these. You can find the full recipe at Jessica of My Baking Heart and Margaret of The Urban Hiker blogs. Our hosts for this week! To see what others thought of this recipe head over to Tuesdays with Dorie and check them out! 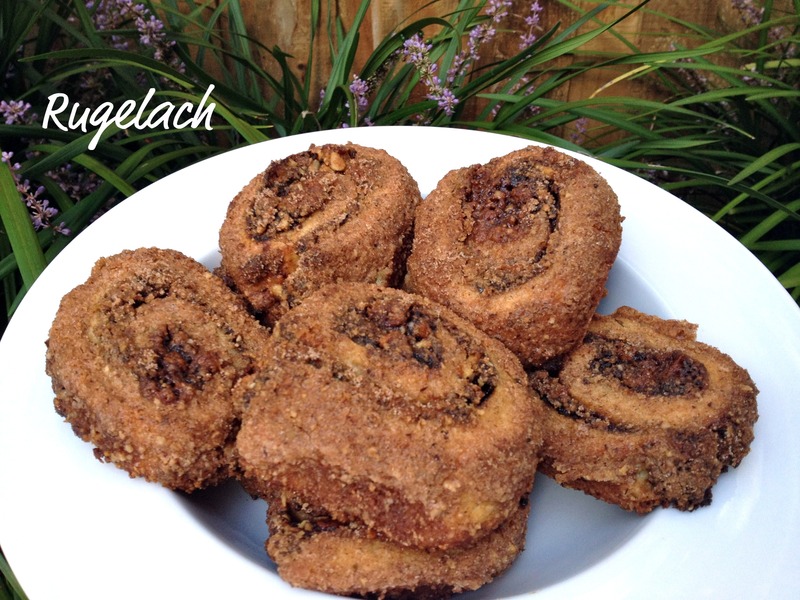 Tags: baking, cooking, food, nuts, prunes, recipes, rugelach, Tuesdays with Dorie | Permalink.